My journey on Friday was very pleasant and, once I had settled into my room, I did some last minute preparations and then slept soundly ready for a relatively early start in the morning. Saturday morning found me setting up my table and stand. I was engraving a garden piece on a natural "round" of boxwood - one that I had started to engrave in Chicago. Saturday was most pleasant and successful; the evening equally pleasant and relaxing. On Sunday, I took the opportunity to explore the work of the other presses. I was particularly keen to visit Oak Tree Fine Press to get my first view of "A Outrance", the extract from Philip Pullman's Northern Lights that I have contributed engravings for (see this earlier post). I was not disappointed. It is a superbly produced book with a generous page size. It is available for sale here in three editions. Seeing this exciting book, catching up with the Oak Tree Fine press Team and meeting Philip Pullman were just some of the things that made this a weekend that I will always remember. 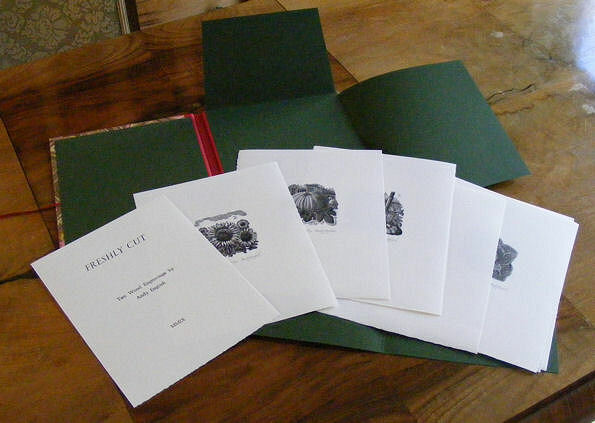 I decided to make thirty portfolios of the engravings that I had decided to edition from the "Freshly Picked" project. This is called "Freshly Cut". 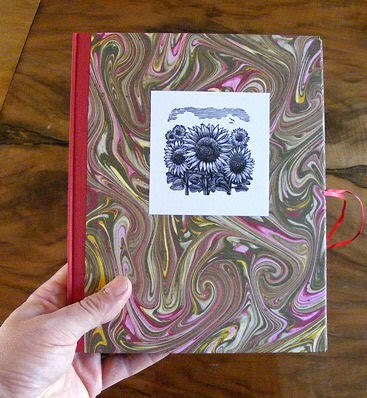 Each portfolio is handmade with red spine cloth and tie ribbons and marbled paper covered boards with dark green card inserts to hold the engravings. Each portfolio contains the ten engravings with the same edition number. The first set are all numbered 1/100 and so on. The Freshly Cut Portfolio is available from my website at a price of £135. However, bricks wrapped in brown paper provide the weight for larger stacks of drying volumes. After a week of long days and late nights, everything was ready to set off for Oxford.